Teach For Green is a nationwide Do It Yourself (DIY) green energy workshop movement that aims to create awareness and entrepreneurship among students. This social enterprise works relentlessly to stimulate the prominence of green energy, integrated environment management for a sustainable future leading with values and ethics of caring for natural habitat. Teach For Green aims at creating responsiveness by providing unique educational setting for developing congenial relation of an individual with the surrounding through hands-on i.e. DIY (Do It Yourself) workshops. Enabling individuals & communities to rely on Green energy sources, promoting sustainable living practices integrated with values and ethics of caring for nature and the world around us. Green- Growth with resource enhancement & sustainability. The organisation works towards providing life skills training to students with sensitisation towards environmental & climate issues at individual, household and community level. Despite leaps of modernisation in technology, over 30% of rural households in India still live in darkness. On the other hand, there is a lack of development of individual personality, activity based learning, and parental engagement child's development. All these factors discourage them from attending school on a regular basis and hence significant dropout happens. To tackle these problems, Teach For Green is an initiative that provides essential learning, training and skill development to the child. Skill development activities can help them understand the importance of learning and finding solutions for grassroots problems which will be sustainable in the long run. A child spends the majority of his/her time in out-of-school setting. The families in low-income groups lack the awareness, capacity, and capability to engage effectively in their child’s development. This can be attributed to low level of education and exposure of the parents. Our hands-on activities are child-centric which helps them to think creatively and innovatively, towards participative learning which simulate their thought process. It will contribute towards personality development as well as skill development which encourage them to be attentive in school, to enhance their performance in exams and also in co-curricular activities. Our focus is to enable them in discussing and solving community level environmental & waste management issues on their own and this will help in rebuilding the faith of parents and community on school system and will also empower them to contribute to their child’s development. For past many years, there are organisations both government and civil societies which are working on improving the education system on subjective and curriculum manner. There has been a significant increase in programs to spread awareness in the areas of green and clean environment like promoting green energy products, climate change, waste management, sanitation, and different types of pollution regarding research, awareness, and development. This happens in two different manners. First, there are institutions which are providing environmental education only in a superficial manner which distracts and not sensitise the citizens of its real importance on an individual and societal level. On the other hand, there are organisations which are working on manufacturing different kind of products on green energy and waste management. These organisations are also advertising and promoting the sales of these commodities. The problem with these products is that they are not sustainable in the longer run and these are just promotional activities for some business organisations for profit making . Also, problems with repair and maintenance of these products persist if there is some technical snag with wire or fuse. In that case the whole product becomes garbage. In our innovation, we are linking both the problems discussed above. We are not working on the environmental issues superficially; we have designed simple and interactive modules using circuit designing and associated activities which involve simple and indigenous components. It’s a Do It Yourself approach for designing a workable model using recyclable materials from the households and surroundings. We show them the impact of unclean and green environment and enable them to choose the one which they think is best for them. Our primary objective is to reach out to young school going students who lack interest in learning and not involving themselves in the activities of their interest due to lack of proper resources, hands-on activities and proper mobilisation. When young minds experience something themselves, it leads to change in the habits and helps them become a change maker. TFI Need Your Support. Visit Growth hub. Mr. Ajay Kumar is the Founder and Director of Teach For Green. For last Six Years Ajay has been involved in research and has gained thorough knowledge in the concept of green energy. He worked on fabrication of solar thin films, different ways to produce bio algae fuel & environmental friendly uses of fly ashes, he presented his works on various conferences. He found that in India there is lag between research & field implementation, so later he was a part of the SBI Youth for India fellowship program and there he realised the problem faced by rural people due to non-availability of resources. It was at this time when he came up with the idea of designing different affordable designs on green energy like decentralised solar lighting system, solar mobile irrigation pump and improve Chula with the help of waste materials. Then he joined India Fellow and worked in research & Innovation solar smart grids, he found that in still people both rural & urban not accepted & adapted green energy solutions in household level so A medium was needed to achieve this and Teach For Green was established. His aim is to reach to every child of India to create the awareness about green energy not only theoretically but also Do It Yourself activities and let the youth of the country lead this shift towards the Green Energy. 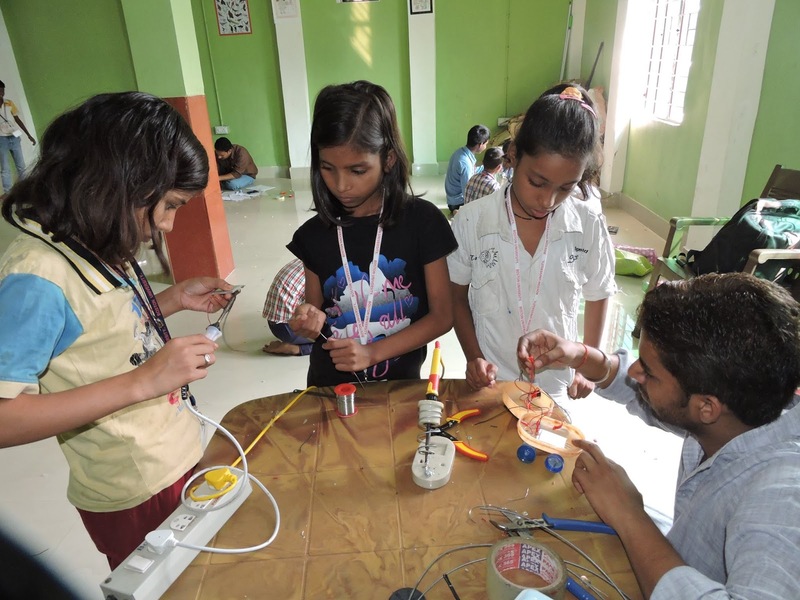 Teach For Green has conducted various short and long duration workshops till date. The growing response to these workshops has been immensely inspiring. We, through our interactions have been able to unlock the creativity of rural children, allowing them to think for themselves, to be confident in their decision. We have managed to spark curiosity among the community in getting them to ask about the technical aspects that they are unable to grasp, thus nudging them slowly to be at par with the national level. • We have developed a 35 weeks module on activity based learning which we conduct once in a week with schools under school support program running in 5 schools in Delhi with 250 kids. • We are running youth innovation center for children from nearby rural areas and for underprivileged community, 120 youths are involved with one youth innovation center. • We have conducted 20 green energy workshops with 950 school students in 11 different states, both government & private schools. • We have conducted green energy entrepreneurship development workshop with 120 rural youth & women are participated. • We are running our own youth innovation center where 60 students are participating in morning and evening pre classes on skills, science and basic science and technology learning at Nehura Village, Palamau, Jharkhand. There also has been a sense of awareness towards importance of education and skill-development in the rural communities while making them capable of bringing a positive change to their lives. Nothing satisfies us more than the faces of rural children when they proudly declare being capable of assembling and designing solar lamps and other circuits or a rural youth when he is capable of providing electricity to his house and the adjoining house. Support the TFI movement to make younger generation more environment conscious through Growth hub. Contact us To Publish About Your Organisation.